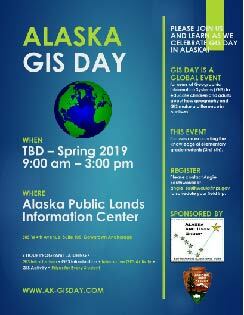 Alaska GIS Day: Who should attend? Anyone interested in learning more about geography and the technology of GIS! The presentations and activities this year are geared towards elementary age students, but anyone with an interest in geography or GIS will enjoy them. No previous experience with GIS is necessary to participate in GIS Day events! We encourage teachers of math and science to bring their students to GIS Day. Teachers should plan to spend two hours participating in scheduled activities and may wish to allow extra time for exploring AAPLIC exhibits with their class. Classes will be scheduled for time slots beginning at 9:00 AM and ending at 3:00 PM. There will be a break in events from 11:30 to 12:00 for participants to enjoy packed lunches brought from home. Please contact us now to reserve space for your students at this GIS Day event. We are limited to approximately 180 students and have met our capacity in previous years.